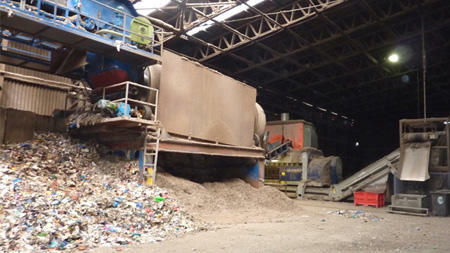 The managing director and former operations director of a recycling firm have been handed prison sentences and the company fined £800,000 after failing to prevent an operative from being drawn into a conveyor, along the line through a trommel and into an industrial waste shredder. Latvian Karlis Pavasars was working for Mid-UK Recycling at the firm’s Barkston Heath site near Ancaster in Lincolnshire when the incident happened on 19 July 2013. Pavasars, an agency worker, was cleaning near a conveyor that fed the shredder when the recycling line was started up and he was drawn in. Health and Safety Executive (HSE) investigators found that the fixed gate that prevented access to the conveyor had been removed weeks before the incident, allowing workers free access to the area. Managers were aware that the gate was not in place a few days before the incident. An inquest on 10 July 2015 ruled the incident accidental. Pavasars was identified by DNA from his toothbrush after parts of his body were found in the shredding machine. The HSE inspector at the time of the inquest, Dr Dominic Swan, said the death was due to a lack of guarding around the conveyor. “Other contributory factors were the lack of control and management of personnel in the shed, poor risk assessments, lack of procedures for undertaking maintenance, cleaning and clearing of blockages and lack of supervision of personnel,” he told the inquest. Mid-UK Recycling, which specialises in producing fuel for energy-from-waste plants, pleaded guilty at Nottingham Crown Court to breaching ss 3(1) and 2(1) of the Health and Safety at Work Act. It was fined £800,000 and ordered to pay £100,000 in costs. Managing director Christopher Mountain pleaded guilty to breaching s 37 of the Health and Safety at Work Act. He was given a 20-week prison sentence, suspended for two years, and fined £50,000. Former operations director Alan Munson pleaded guilty to the same charge under the act. He was also given a 20-week prison sentence, suspended for two years. The firm said that since 2013 it has invested heavily in improving its systems. It has employed a full-time OSH manager, as well as a director with responsibility for safety and health. Last year, it said it had achieved OHSAS 18001 accreditation and all its managers have received the IOSH Managing Safely training. The company added that it has introduced a new traffic management system and safety walking routes for pedestrians. It also carries out regular internal audits and spots checks, and has employed an external auditor to carry out reviews.